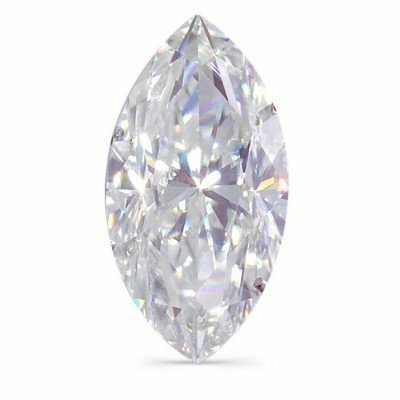 The Marquise Moissanite has 57 Facets and is available in sizes (mm): 4x2 to 14x7. This gemstone has an approximate length to width ratio of 1.75-2.25 to 1 with the ideal being 2 to 1. The desired mounting should have six prongs securing the stone properly with four prongs holding the body of the Moissanite and two V-shaped prongs secure and protect the pointed ends. We carry only the top quality Moissanites with color comparison to I-K of the diamond color grades. Our Moissanites are comparable to VS1-VS2, meaning very small inclusions that are not visible by the naked eye. Every Charles & Colvard created Moissanite jewel is carefully hand-cut by master gem cutters to create maximum brilliance and fire. $10 Flat Rate for ground shipping, or choose 3rd Day shipping for $10 more, or 2nd Day shipping for $20 more, or NEXT DAY shipping for $30 more. ---- *Carat is the traditional measuring unit of a diamond's weight. Moissanite stones are slightly lighter than diamonds. For example: A 6.5mm Round Diamond would weigh 1.0 ct. A 6.5mm Round Moissanite would weight 0.88 ct. The two stones would be the same size 6.5mm in diameter. All stones are listed with their actual size in mm and the diamond equivilant in carats.